I’ve been back on the snowshoes since our big snowfall last week. Although the snow has been wet and sticky, meaning that it tends to pack to the lacings, the snowshoes are still a better option than just hiking “barefoot”, and the skis sink down into it too far to be practical. Although for a while it was possible to hike through the forest on the crusty snow cover, warming temperatures soon put a stop to that. The snowshoes gave me an opportunity to visit some of the areas I haven’t been to in a couple of weeks. One such spot was a patch of trees, a peninsula of woods that juts out into our meadow from the neighbour’s forested land. I’ve walked through this patch numerous times since the fall. Yesterday I decided to go investigate some fungi I could see growing on the side of a snag. The fungi was too withered and covered in algae to be able to identify, but while checking it out I noticed something else. Can you spot it in the photo above? It’s the egg mass of a Gypsy Moth. It’s slightly fuzzy and a soft cream colour. Inside all the fine hairs are little eggs, each about the size of a rainbow sprinkle. 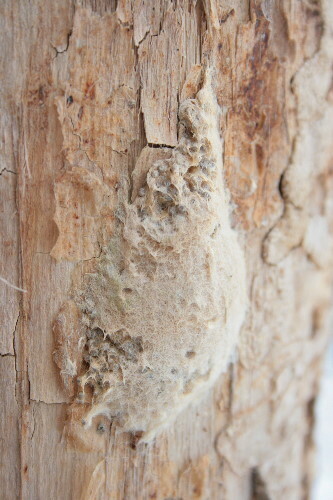 I’ve written about Gypsy Moth eggs before; in the first winter of this blog, when it was still a young month-and-a-half old, I photographed an interesting patch on a tree in the forest behind my parents’ old house (back when they still lived there), which I thought to be a slime mold. A reader corrected me, happily, and when I went back to look at it again I found several more. Although Gypsy Moths have the potential to be extreme defoliators and serious forest pests, the sort of infestation that completely obliterates a forest canopy is rare. (Check out these posts at the Ohio Nature Blog for some startling examples of this.) 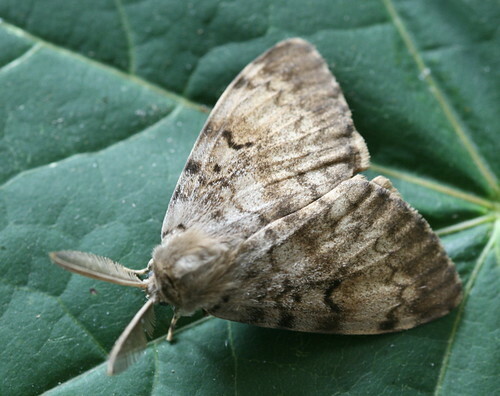 In reality, the vast majority of the time Gypsy Moths are no worse a pest than any of our other numerous defoliators, such as tent caterpillars or fall webworms. 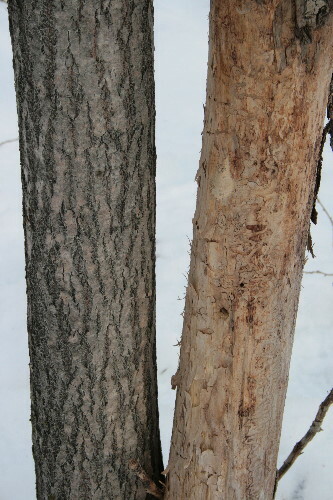 The damage they do is usually more aesthetic than life-threatening for the tree, and unless the tree is already weakened due to disease or another infestation, it will usually bounce back quickly, putting out new leaves by the end of the summer. Gypsy Moths aren’t native to North America; they were the result of a silk production experiment gone awry, and they’ve now spread over a large portion of the northeast. If you find some eggs in your area there’s probably no cause for immediate concern. I just left these where they were, as they were the only ones I could see. If you start seeing infestation levels, though, such as the crazy numbers in the Ohio Nature Blog’s post, might be worth contacting your local environmental authorities to see if it’s cause for concern. It has beautiful, feathery antennae. A lot of species are assumed to be that way, Karen, but aren’t actually as bad as their reputations make them out to be. Also, there’s “introduced” and then there’s “invasive”, with the latter meaning an aggressive species that will actually push out native species, while the former refers to species that still live relatively peacefully alongside the native ones. I’m actually somewhat partial to Gypsy Moths and their native relatives. to do to save them. Most of the other trees survived. I well remember going out in the late afternoons with an old barn broom and sweeping down the lower parts of the oaks which were covered with the caterpillars on their daily trip back up the trunks. Also was not fond of hosing down the green slime (digested leaves) piling up on the deck each day. Ironically, I grew up in Medfore, MA where a would-be silk farmer set them free! No love lost here. to do to save them. Most of the other trees survived. I well remember going out in the late afternoons with an old barn broom and sweeping down the lower parts of the oaks which were covered with the caterpillars on their daily trip back up the trunks. Also was not fond of hosing down the green slime (digested leaves) piling up on the deck each day. Ironically, I grew up in Medford, MA where a would-be silk farmer set them free! No love lost here. Great photo of the eggs on the tree, I wonder if other species have similar egg masses. Next Next post: First moth(s) of 2010!